This locality in the Hawkesbury was probably called 'Comleroy Road' to distinguish it from 'Comleroy' in the Hunter Valley. 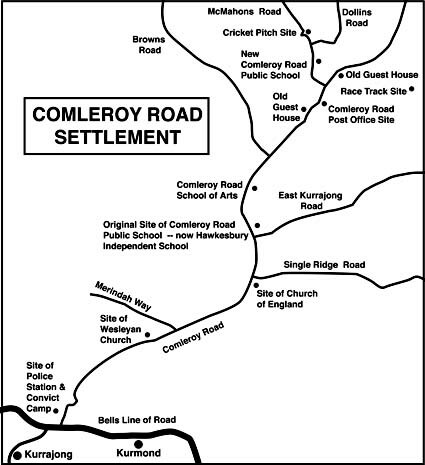 Comleroy Road had a post office, school, hall, churches, cricket club, guesthouses, racetrack, and a police station and convict camp. 'Comleroy Road' residents in 1890s and 1900s sometimes shortened the name of their locality to 'Comleroy' for simplicity. In articles in The Gazette newspaper in the 1890s and 1900s, the two names were used interchangeably, often within the one paragraph. However, the official name of this locality was 'Comleroy Road'. Whilst the proposed suburb name, 'Comleroy', is shown near Kurrajong in some recent street directories, this suburb name has now been withdrawn. This region, four km north of Kurrajong, has now been officially included in the 'Kurrajong' area.